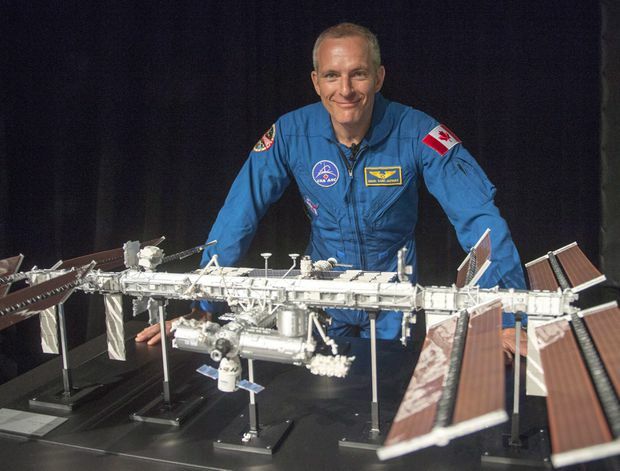 Canadian astronaut David Saint-Jacques inspects a model of the International Space Station at Canadian Space Agency headquarters in Saint Hubert, Que., on Wednesday, November 29, 2017. Mr. Saint-Jacques touched the science centre’s latest attention-getter, which was collected during the Apollo 17 mission in 1972. But Mr. Saint-Jacques said he would like to see the lunar footprints of Canadians. Mr. Saint-Jacques, who launches for the orbiting space laboratory on Dec. 20 on board a Russian Soyuz craft, will celebrate his 49th birthday on the space station on Jan. 6. “The schedule is still open to debate ... but I’ll be back on Earth,” Mr. Saint-Jacques said Friday.